From 2007 to 2012, the SEC took home took home four of the six Heisman Trophy awards as Cam Newton, Johnny Manziel, Mark Ingram and Tim Tebow won the prestigious award. Jameis Winston and Marcus Mariota took home the last two Heisman’s and the award has started a QB trend. The last five winners have been quarterbacks. A few years ago, the SEC had QBs galore but over the last few years the QBs of the SEC have failed to make a big impact. Arkansas is poised to take another step forward this year under Bret Bielema. With the Hogs threatening to get into the upper half of the SEC West, this makes them a team to watch on the national scale as well as potentially in the Heisman race. The likelihood of Arkansas having a Heisman candidate is slim because they have not one but two really good running backs in Alex Collins and Jonathan Williams and they share the load. Both ran for 1100 yards and both had 12 rushing TDs in 2014. If one of the two does break-out, I think it will be Collins. Fournette has that “star” ability that is looked for in a Heisman candidate. As a freshman he finished sixth in the SEC in rushing. Something else that will help him is that he also returned kick-offs. If he continues to do so and can get a couple of TDs (he had 1 last year) on special teams that will really help his cause. The problem I see with LSU is a team problem. They have struggled at QB and who knows what their defense will look like without John Chavis this year. LSU won’t crash and burn but they might have a down year by LSU standards and that means Fournette will likely have to wait for Heisman talk. Allen may seem like a longshot but let’s not forget that Johnny Manziel came out of nowhere to win the 2012 Heisman. The best thing Allen has going for him is the offense in which he plays. The Aggies will put up points and Allen will put up stats. The big question is if they can put up the wins needed to get him recognized or if he can do it in such a fashion that he captures the nation’s imagination like Manziel. Jeremy Johnson was probably the best kept secret in the SEC last season. Or maybe, because he didn’t see the field that often, he was the worst utilitzed player in the league. Gus Malzahn hitched his wagon to Nick Marshall and that worked well but Johnson has the ability to be a superstar. He doesn’t have the running ability of Marshall (although he can run) but he can stretch the field with his arm and he will really open up Auburn’s offense this year. Whether that leads to Heisman talk depends on whether the Tigers win the big games. When I watched Alabama games last year my biggest question was…why aren’t they playing Henry? He finished the year 12th in the league in rushing with 990 yards but he also finished with 5.76 ypc which was a lot higher than counter-part TJ Yeldon. With Yeldon gone and the Tide backfield thinned out a bit, this should finally be Henry’s year. Look for big things out of Derrick Henry in 2015. Dak is the only player on this entire list that was a legitimate Heisman candidate last season. After starting out 9-0, Prescott was near the top of almost everyone’s list. The Alabama game was his undoing and the Bulldogs went just 1-2 in their last three regular season games. 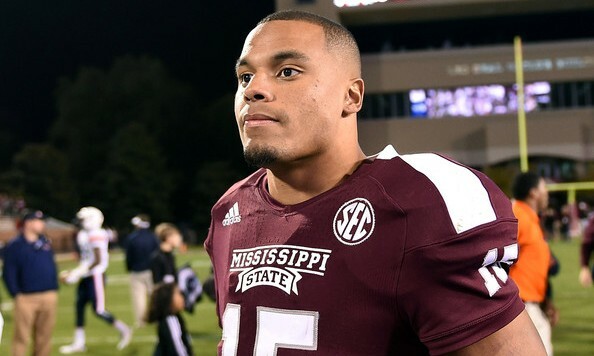 If Dak and the Bulldogs can find a way to finish this year, Dak could be hoisting up the trophy at the end of the season. As a freshman, Chubb finished second in the SEC with 1547 yards and first with 14 rushing TD (tied with Dak) and 7.06 ypc. The weird part of Chubb’s story is that he started the year buried on the deep Georgia depth chart and only averaged 6.2 carries over the first five games. Over his last eight games of the year he averaged 165 ypg. The questions for Chubb are can he maintain this over a full season, will his backfield mates regain their health in order to share the load and can Georgia finish in the Top 10? Without a doubt, Chubb is the biggest contender for the trophy coming out of the SEC and if he can duplicate what he did over the last eight games last year it will take an extra special athlete to beat him out.